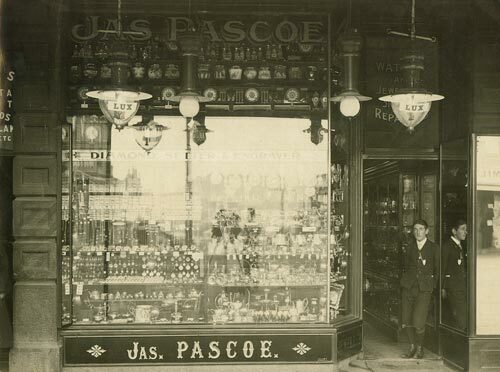 James Pascoe, jeweller and founder of the Pascoes chain of jewellery stores, stands outside his first store at Three Lamps, Ponsonby, Auckland. The area had less foot traffic than the shopping street of Karangahape Road, so rent was cheaper. To make ends meet, Pascoe did repair work while he built up his business. Once he had more capital he moved to Karangahape Road.